The celebration of a loved one’s life can be a very emotional time. 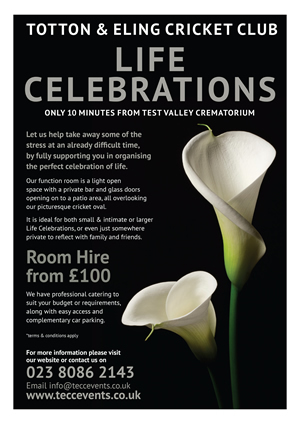 We aim to fully support you in organising the celebration, to help take away some of the additional stress at an already difficult time. Our Function Room is ideal for small & intimate or large Life Celebrations, or even just somewhere private to reflect with family and friends. The room is a light open space with a private bar and glass doors opening on to an outside patio area, all overlooking the picturesque Cricket Green. We offer professional Catering to meet your budget and requirements. You are able to bring in your own room decoration to suit your celebration. However, we do have a large selection for you to hire if required, from white table linen, simple flower vases to tea lights & holders, please ask for details. We offer the hire of a small PA System for you to play soft background music during the celebration, and a projector if you wish to share special memories with your guests. Please ask for details. Room Hire for a Life Celebration is £100 which includes a staffed, private bar and our standard tables & chairs set up to support your event.